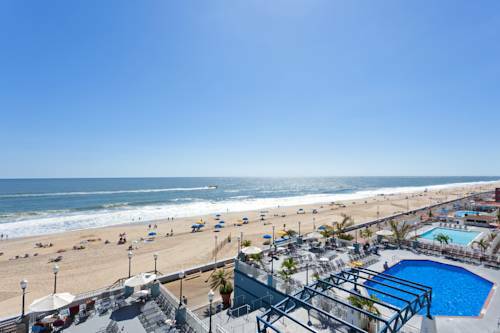 Hotel's Boardwalk Location in Ocean City, MarylandThis oceanfront hotel's all-suite property is conveniently situated downtown, bringing guests directly to the beach while still near local businesses. Our location along with upscale amenities and service make the Holiday Inn Hotel & Suites Ocean City one of the best beachfront hotels in Ocean City, MD.The ultimate vacation awaits you in Ocean City! View the oceanfront from one of the hotel's spacious suites, each with its own balcony. Trimper's Amusement Park, located on the boardwalk, lets guests ride roller coasters and play carnival-style games. Vacationers even have a chance to see the famed wild horses at nearby Assateague Island National Seashore.Turn your business meeting into a beachfront getaway. Our hotel's location in Ocean City, MD makes it easy to get to the Roland E. Powell Convention Center, Atlantic General Medical Center and OC Municipal Airport (OXB). Your clients will be thrilled to hold a meeting in our 1,050-sq-ft hall next to the beach.You'll be truly pampered during your stay with us. Have fun with family in the indoor or elevated, outdoor pools. Head to the large game room to compete with your friends, then buy the winner a meal at the full-service Coral Reef Cafe, which serves local seafood in elegant surroundings. Or, you can visit the lounge to enjoy a cocktail among the tropical greenery. No one in Ocean City can match our quality of service. The Coral Reef Cafe and Bar is located off the lobby in our 4 story atrium. Serving breakfast, lunch and dinner, the menu has a Caribbean flair. Enjoy one of their specialty tropical drinks while relaxing beneath the palms. Enjoy a cocktail in the four-story atrium filled with palm trees & lush landscaping. You ll be just steps away from one of the finest beaches on the east coast. Assateague Island is known for seeing Wild Ponies and beautiful wildlife all while enjoying the windswept beach. Ocean City is known for it's many beautiful golf courses - Whether you are a serious golfer or a beginner there are plenty of courses for you to play that will challenge your skill level. Visit the Historic town of Berlin and see where Julia Roberts and Richard Gere once filmed the Runaway Bride. While there check out the many shops and restaurants. ~46 miles from Ocean City.